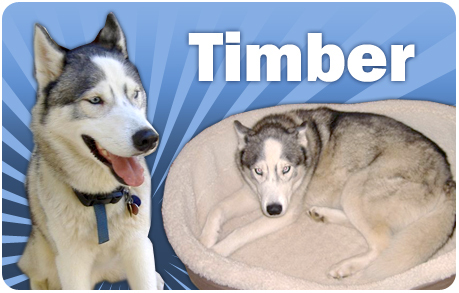 Timber found his forever home on Saturday, February 12, 2011 with Jennifer Caldwell in Crofton, MD. It was a match made in heaven. 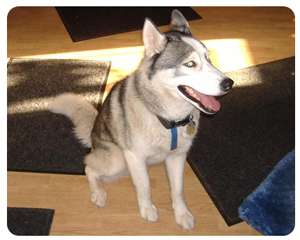 Timber, a Husky/Malamute mix with l-o-n-g legs loves nothing better than running … and running … and running some more. Jennifer, a police officer, runs about three and a half miles every day and wants a running companion. also loves to play fetch and will bring a tennis ball or a toy and drop it in your lap so you can throw it. Jennifer’s home, a long narrow townhouse condo, has a living room and kitchen on the ground floor with no obstacles in between the front and back doors – a perfect situation for a dog who loves to play fetch. Jennifer also wanted an affectionate dog, and fits that description to a “T.” When we first arrived and took him out of the car, before he had a chance to shower Jennifer with Husky kisses, she saw him from her front window and said to herself, “He’s mine!” As noted earlier, it was a match made in heaven. 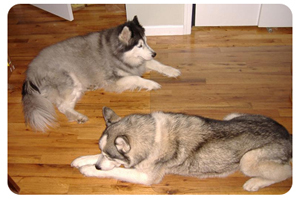 We plan to send Jennifer a subpoena ordering her to bring to the 2011 Tails On The Trails Husky Hike just so we can see the big galoot again. Hi, my name is and I'm a very handsome fellow. My former family really loved me and took good care of me, but my human mom lost her home to something called a "foreclosure." I really don't understand what that means, but she blames it on something called "the economy" - which I also don't understand but which must be something really bad. I also don't understand why the family she moved in with wasn't absolutely captivated by my winning personality and stunning good looks. Did I mention that I'm a very handsome fellow? Well, in any event, they told my human mom that she couldn't keep me and it made her very sad. I heard her telling my human brother and sister that she might have to take me to something called a "shelter" - which sounded even worse than that bad thing called "the economy." Fortunately, my human brother found Tails Of The Tundra on something called "the Internet" and contacted them, which is how I met my foster family. So now here I am with my foster mom and dad and my Husky sister, Bailey. They take us for nice long walks and everyone we meet comments on what an attractive pair we are. Did I mention that I'm a very handsome fellow? Let me tell you a little bit about myself. First of all, I'm cat friendly. I've lived with them all my life and like to play with them. I love to play fetch with a toy or a tennis ball and will bring it back and drop it at your feet so you can throw it again. I love to snuggle and be fussed over and especially love ear scratches and belly rubs. I also love to be brushed and will even roll over and let you do my belly if you want. I know it helps me look my best. Did I mention that I'm a very handsome fellow? My human mom told my foster family that I used to love to pull my 11 year old human sister on her skateboard. I wouldn't go too fast and if she fell off, I would stop and wait for her. I do have one or two traits that my foster family says I need to work on. For one thing, I'm obsessed with food and tend to eat very fast. My humans call it "inhaling my food" and they put a big rock in my bowl to make me eat more slowly. I also tend to be possessive of my food. Although I take treats very nicely, once my kibble goes in my bowl, I don't want any humans to take it away or any other dogs to come near it. You also don't want to leave any food on the counter because I have very long legs and if I can reach it, I consider it mine. I can also be a bit of a knucklehead when it comes to initiating play with other dogs. Instead of giving Bailey play bows, for example, I nip her ears and pull her tail. She doesn't seem to like that and yells at me and tells me off, but I just don't seem to "get it." I can't understand why she doesn't want to "rassle" with someone as good looking as me. Did I mention that I'm a very handsome fellow? Most of the time, however, I'm no trouble at all. When I'm not playing, I'm usually sleeping and I love my doggie bed. I also love to take my humans for nice long walks and walk really nicely on leash, so if you're looking for a walking buddy, I'm your guy. I have lots of love to give and really don't ask for much in return. Could you be the forever home I'm looking for?